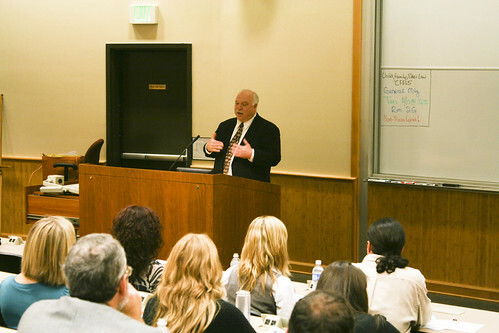 Eminent civil rights lawyer Paul Hoffman recently spoke at California Western School of Law as part of UCSD’s joint speaker series Speaking Truth to Power – a special event for UCSD’s International Education Week 2009. Paul Hoffman is one of the world’s leading civil and human rights lawyers who has litigated numerous landmark cases—some in front of the Supreme Court—involving the Alien Tort Statute (ATS). The ATS allows United States courts to hear human rights cases brought by foreign citizens for violations committed abroad. Additionally, Paul Hoffman has occupied top positions in human rights organizations such as serving as the Chair of the Board of Directors for Amnesty International and legal director for the ACLU of Southern California. In his talk Litigating Human Rights Cases Against Corporations: A View From the Frontlines, Hoffman spoke about how interpretations of international and human rights laws have broadened over time. When arguing cases, he has drawn much of his legitimacy from the ATS. Created in 1789, the ATS was dormant until 1980 when the Filartiga case was brought to trial. The case involved a man in Paraguay who was tortured and murdered by a police chief. The sister of the deceased later came across the torturer in Brooklyn, New York and filed charges against the man who had killed her brother. The judge originally ruled against the plaintiff citing that the “Law of Nations and international law was only something that occurred between states, that it did not apply to people, had nothing to do with the protection of human rights, and that people could not claim rights under the Law of Nations.” This decision was later reversed by the second circuit court which found that “international human rights law had developed to the point that some norms were part of customary international law”, thereby allowing individuals to claim rights under the Law of Nations. After his talk, Hoffman spoke with PROSPECT about the ATS and various cases he’s worked on. PROSPECT: What common obstacles do you face when litigating human rights cases against corporations? Are there any recurring strategies employed by corporations in their defense? PH: One of the difficulties is that they are represented by huge law firms that have unlimited resources and we don’t have a lot of resources; we don’t have good law firms coming in on our side, so it’s an imbalance in terms of resources. It’s always very difficult and corporations have access to power in terms of the administration vis-à-vis the government. PROSPECT: In the cases that you have fought in the past couple of years have you found that the administration was more protective of corporations? PH: The Bush Administration was the most protective of corporations of any of the administrations since I’ve been doing this. They were actively opposed to the use of the Alien Tort Statute – not only against corporations, but especially against corporations and so they filed papers on almost all the cases asking for them to be dismissed on one ground or another. It has not been true in 100% of the cases but it was true in most of the cases, and they have been advocating legal positions that would pretty much wipe out the kind of work that I do. PROSPECT: And under other administrations, it was easier? PH: The Clinton administration was good – they didn’t do a lot, but they filed a brief in a very significant case that was very helpful. The Reagan administration was not so great, but not as active—they weren’t as actively opposed. They filed a brief that was bad, but they didn’t aggressively go out to try to go after the Alien Tort Statute. PROSPECT: In your opinion, how effective is the Alien Tort Statute and how could it be approved upon, if at all? PH: I think it’s a tough question to answer because I think it is effective in ways that are not easily measurable. Over the years it has created a body of international law within the court system that has made judges more familiar with international law and more willing to enforce it. I think that has consequences that go beyond the particular cases. In some particular cases there have been some major settlements that have brought benefits to the plaintiffs and their communities, but there have also been some losses that have been fairly devastating. There has never been a judgment in favor of plaintiffs or against the corporations yet. There have only been two trials and both of them lost and there were a handful of settlements and a couple of lost trials and a lot of the cases are still pending. The other thing we face in terms of obstacles is that the cases take forever. The cases take 10 or 15 years – the Unocal case was in its 10th year, and a lot of the cases I have pending now have been pending for five or ten years. PROSPECT: Is it true that it takes a long time to get companies to actually pay? PH: That’s not true. In the settlements the money has been paid, so that’s never been a problem. But I think the courts are not clear about how far they are going to allow Alien Tort Statute cases generally. There is still uncertainty in the law, more so than I thought there would be at this point, because it’s about 5 years after Sosa and we still don’t know what the rules of the road are on this and that creates difficulties for plaintiffs. PROSPECT: You mentioned the need for some sort of international regulation that would protect people from human rights violations perpetrated by corporations—how much longer do you think it will be until something like that is established? PH: I think it’s going to take a long time actually, I mean unless there is some event that focuses the world’s attention on it. I think in difficult economic times, people are not thinking about ways to regulate anybody—they are thinking about how corporations can create jobs and they are less concerned about human rights. I mean, look at Obama in China: the human rights words – he is saying them, which is good, but human rights are not at the top of the agenda. The top of the agenda is, you know—how is China going to buy US goods and how do we deal with trade deficit, all those things. So there are going to be a lot of challenges out there. My own attitude is that you just keeping pushing on all these fronts and hopefully over time something happens – you lay the groundwork and something will happen that will cause the world to want to do this and it will be in the interest of the corporations to do it. The European countries might take the lead, it’s hard to see right now because the world’s power relationships are changing. PROSPECT: Finally, a goal of UCSD’s International Education Week is promoting international awareness. How do you suggest we educate and encourage students nationwide to stand up for people in other countries? PH: The best way to do that? Well, you know, I think that maybe the answer is to get an issue that people can relate to. One of the things that a lot of human rights groups are doing now is working on issues related to extreme poverty. My own view is that that is the thing that people really need education about, and young people can really take the lead on that because older people are really set in their ways, particularly in this country—people don’t view economic and social and cultural rights as rights. I know Amnesty International has a big international campaign on this. There are a lot of stories out there that are heart wrenching, where you can grab people through their hearts and then have them think about what their principles are. I think that would be a good thing to do. I think there are a lot of people around the world doing it so you have a lot of materials there and other people are doing it and it’s important. Since we are writing about CONVERSATION WITH CIVIL AND HUMAN RIGHTS LAWYER PAUL HOFFMAN | PROSPECT, The fact is, law has been an important part of society since it began, with implied legal and social orders and boundaries that could not be crossed. Today, it is a sophisticated network of guidelines and regulations which is adapted to shape the way we live our lives from one day to the next. There is no doubt that the law is important to the citizen, and plays a profound impact on the lives of the people on a daily basis.